Fate Sunk 12 April, 1945 in the North Sea north-west of Bergen, Norway, in position 60.44N, 04.39E by torpedoes from the British submarine HMS Tapir. 48 dead (all hands lost). The wreck of a German World War II submarine that was sunk with 48 people on board has been found off Norway’s coast during work on an oil pipe, a maritime museum official said Monday. The “U-486” was torpedoed and broken in two by a British submarine in April 1945 shortly after leaving the western Norwegian town of Bergen, according to Arild Maroey Hansen of the Bergen maritime museum. Lying at a depth of some 250 metres (820 feet), the wreck was found when Norwegian oil company Statoil was scouting the area as a possible location to lay down an oil pipe. “The submarine had a special coating on the hull. It was a synthetic rubber coating designed to significantly reduce its radar signal,” Maroey Hansen told Norwegian public radio NRK. 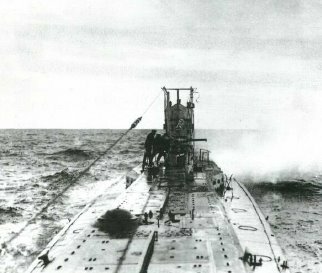 The “U-486” lies some two kilometres (1.25 miles) from the German “U-864” submarine, which was also sunk in 1945 with dozens of tonnes of mercury on board, a dangerous cargo which has caused politicians headaches for years. They have been examining how to best limit the environmental risks posed by the mercury, hesitating between whether to lift the wreck — it is also broken in two parts — or to cover it in a hard sarcophagus. 24 Dec 1944. Sinking of SS Leopoldville On Christmas Eve 1944 U-486 torpedoed the SS Leopoldville in the English Channel 5 miles from the port of Cherbourg, France. The troopship was transporting 2235 American soldiers from regiments of the 66th Infantry Division. The ship finally sank 2 1/2 hours later. Everything that could, went wrong: calls for help were mishandled, rescue craft were slow to the scene and the weather was unfavourable. 763 American soldiers died that night, making this the worst loss an American infantry division suffered from a U-boat attack during the war. The Allied authorities were embarrassed by the incident and decided to bury the case. Many loved ones were told the men were missing in action although they were already dead by then, later to be classified as killed in action. The files were not opened to the public until 1996. U-486 had not said her last word, as she sank the British frigates HMS Affleck and Capel only two days later in the same area, before returning on 15 Jan, 1945 to Bergen, Norway. This entry was posted in The world's submarines and tagged HMS Affleck, HMS Capel, HMS Tapir, statoil, U-Boat, U486 on March 26, 2013 by jasonlockley.